BOSTON, MA (June 24, 2016) – Tocci Building Companies (Tocci), a Boston-area construction management company and leader in virtual design was awarded with a National Safety Award by the Massachusetts branch of the Associated General Contractors of America (AGC) on June 24th at The Boston College Club in Boston. 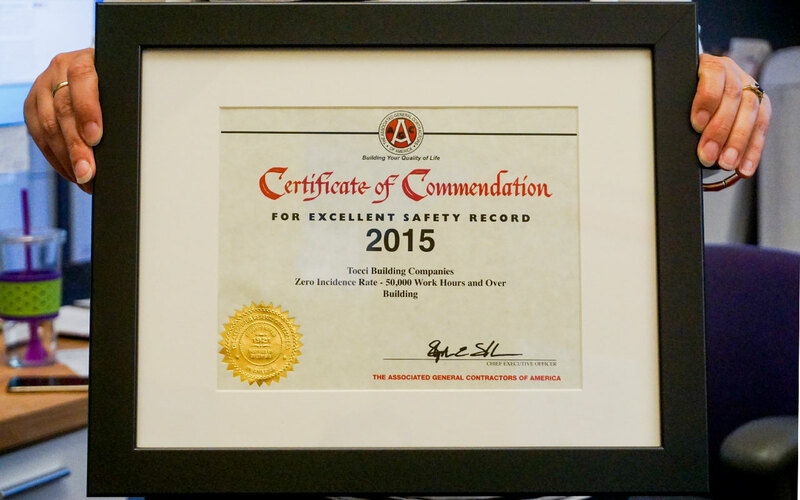 This marks the 23rd consecutive year that Tocci has been a recipient of the award, and further distinguishes the company as a leader in safety. For more than 40 years, the US Department of Labor’s Occupational Safety and Health Administration (OSHA) and its state partners have inspired positive and dramatic change in workplace safety. 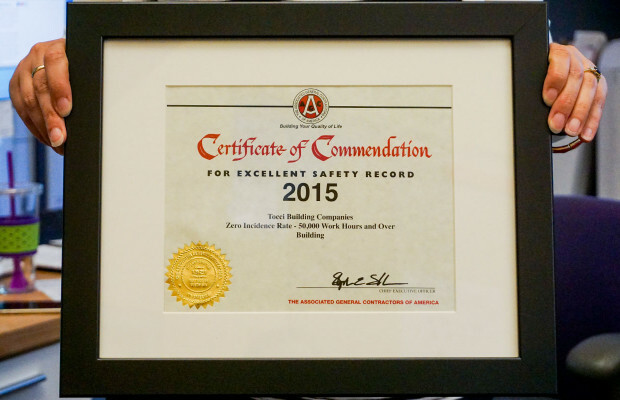 Tocci continuously strives to promote and exceed the standards set by OSHA, ensuring that its jobsites are managed with an even higher level of safety compliance than what is required. Tocci consistently surpasses standard OSHA requirements, and recently hosted renowned physical therapist, Pat Agostino, at one of its large residential project sites. He discussed the importance of maintaining a safe and healthy lifestyle at work and at home, and provided easily-digestible tips to improve overall safety, as well as health and wellness, without major lifestyle changes.